Q: How does it feel to be playing a core venue at Tramlines this year, especially so early on since forming as Blessa? A: We’re incredibly lucky to be playing a venue as special as Sheffield Cathedral, in terms of sound and atmosphere no other venue can compete with it, in our experience. Q: What do you enjoy most about Tramlines festival? A: Since we’ve graduated it’s become a bit of a reunion site for our friends, so it has a bit of a nostalgic element already for us. It’s also nice to give some substance to ‘I’m in a band now’ for the friends with the real jobs. Q: The lineup has some great names this year. Is there anyone you’ll be sure to watch? A: Woman’s Hour have been stunning every time we’ve seen them so we’re really excited about that, and Seize The Chair at The Forum is totally unmissable. Q: How did Sheffield bring you together, and do you consider the city to be your hometown? A: We met through all the normal channels you would at University, and followed the well-trodden path of forming a band, not expecting much, but us believing in this band is a huge part of Sheffield becoming our hometown. Q: Would you say that you’ve been influenced by the Sheffield music scene; if so, how? A: Sheffield is producing some great bands at the moment, but allowing locality to define you can be extremely restrictive. I just think that its rich diversity is something to be absolutely cherished and celebrated. 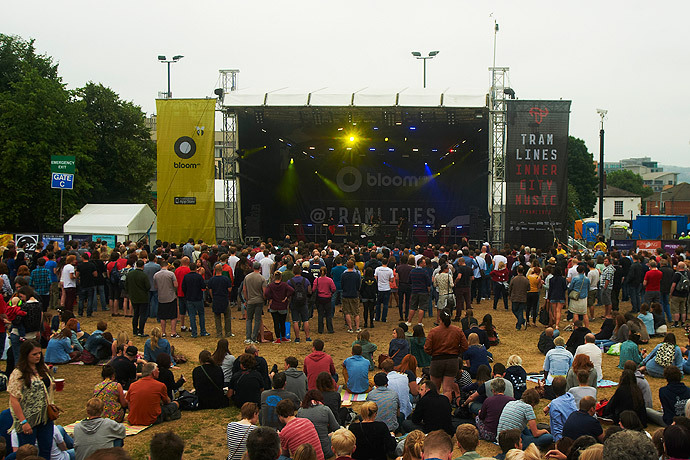 Q: And finally, why should festival goers fit you into their Tramlines schedule this year? A: Because it will be the night that soft rock disco will be born. Q: How does it feel to be playing at your hometown’s biggest festival? A: Exciting! And nerve wracking. EVERYBODY goes to Tramlines so it’s important to get everything spot on. A: Nothing beats a hometown gig. I think the audience relates to and cares for the music more, simply because they come from the same city. Q: The line-up has some great names this year. Is there anyone you’ll be sure to watch? A: I’m looking forward to seeing PINS and Deap Vally at the Leadmill on Saturday night. It’s heartening to see two great, all female bands topping the bill at one of Tramlines’ most important venues. A: The people. The sense of togetherness and camaraderie. Tramlines weekend is by far the best weekend to visit Sheffield, everybody is always in great spirits, even if it’s raining! A: This year myself and my backing band will be accompanied by the very awesome Abbeydale Singers at the Cathedral (Saturday, 6.30pm) for a very special, one off set. It will be dramatic, haunting, heart wrenching but also uplifting! One definitely not to miss! Andy: It’s fantastic for Sheffield to host a festival on the scale of Tramlines – not many cities have that opportunity or vision, so it’s a real credit to the city. I think it makes it really special being a hometown act – you have your own performance to get excited about, but you are also able to show off the best of Sheffield to acts coming from all over the world. Andy: It varies to be honest – Sheffield shows are always fun, but you have to be conscious not to overload your hometown fans, and give them something new every time. It’s been over six months since we played Sheffield, and I think we’ve moved on a lot in that time. It’s always exciting to play to new crowds and at new venues, so national and overseas shows can be a lot of fun in different ways – we’ve been lucky to play a lot of UK and ROI shows in 2014, and alongside a lot of amazing artists. We’ve been made very welcome by everyone! Andy: We’re so excited to be appearing alongside Public Enemy (maybe daunted would be the better word…), and they’re obviously a huge draw for a lot of people. With so many people in the band, we’ve all got something we HAVE to see over the weekend, but then the beauty of a festival is stumbling across something that blows you away. Personally, Screaming Maldini always pull out something special, BadBadNotGood have really impressed me recently, and you can’t beat Sister Sledge for a Saturday night headline, so I’ll definitely be catching them. Andy: We’ve been away during Tramlines for the past three years, so we know that it’s going to be pretty different to the last time we played – we’re all looking forward to exploring the different venues, and catching up with all the bands and punters who are out. Andy: Because you’re going to struggle getting in anywhere after Public Enemy? Seriously though, we’re really excited about the chance to perform to people who’ve probably never seen something like RBB before – brass, beats, vocals and DJ, all at high-energy and playing our own music – hopefully showing off what Sheffield can create. And for those who have followed the band for a while, we’ve got some new tunes too! A: It feels unreal. It seems to come round faster every year. But it is always a pleasure to play, and be one of many representatives for our home town. A: We have had some amazing truly unforgettable responses from home crowds. However on the other hand, we have had memorable ones from out of the country. Last year we embarked on mini tours of Spain and Italy. The crowd response and reaction over there was every bands dream. So i’m afraid there is no black n white answer on this subject. Like many things in life it is many shades of grey, which in the end all boils down to the tastes and cultural personalities of the separate areas. A: Public Enemy, Sister Sledge, Jolta, Hey Sholay, Slow Club, are to name a few. We are going to try and see as many artists as possible. A: One word: VIBE! The whole atmosphere of the festival which in the past has always been so positive. But also, the most enjoyable thing is playing. I know that sounds a little selfish, but it is what stirs our loins, and the reason why we do it after all. A: We personally find it hard to big up ourselves. All we can suggest is, that people come to see us, if they want to see two guys playing their hearts out (throws up into a bag labelled cliché) and never easing up in the pursuit for phat, choice riffs, and tasty rare groove. Then come to see us. We endeavour to fulfil your band watching needs. A: Eds smashed it booking the Gatsby for Sunday so we’ll be there a lot of the time I reckon. I heard Hawaii 666 may be coming back from the grave sometime too. A: Sheffield shows are always really fun and can get pretty wild, but having a good reaction from your hometown is kinda like your mum telling you you’re good looking right? Its a mix really how people go for it, town to town, night to night. We’ve been doing this a while now and we’re lucky enough to play most places and people will come to see us, which is really nice. Q: What is your favourite element of the Sheffield music scene? A: There’s a real community of creative people in Sheffield that help each other out. We’ve been helped along by so many people with recordings, artwork and with shows so it feels good to be able to give back. I think that with the cheap rent for houses and spaces is why theres alot of good music coming out of Sheffield at the moment. The sound of Sheffield has become more diverse in recent years and although the Arctic Monkeys are great its nice to see bands doing other things. A: We’ll be playing a few new songs that you probably won’t have heard that are on our first ever album! All will be revealed soon. Queens Social Club, Sunday, 4pm. Be there!